Emory's Veterans Day events include an annual flag ceremony on the Quad. Emory Photo/Video. Emory's Veterans Day events offer the opportunity to support those in the Emory community who are serving or have served their country in the military services. Veterans Day is Nov. 11. Emory's events, to be held Tuesday, Nov. 11, and Thursday, Nov. 13, include a flag salute ceremony, speech and care package drive. 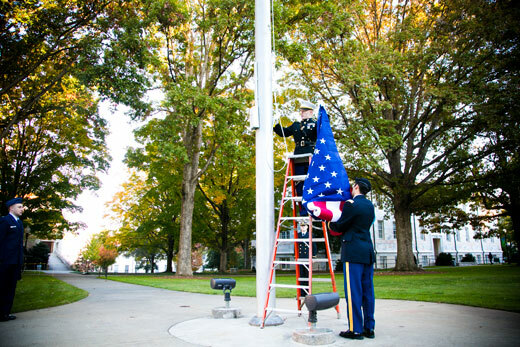 Tuesday, Nov. 11, 10:45 a.m. A flag salute ceremony will be held on the Quad. Campus and alumni leaders will speak at the event, which features a moment of silence at 11 a.m. Refreshments will follow. Thursday, Nov. 13, 4:15 p.m. Tom Beaty, Emory alumnus and founder of the Witness to War foundation, will speak in Room 130, Goizueta Business School. Thursday, Nov. 13, 5 p.m. A care package drive for those serving overseas will be held on the business school commons. The care package drive is part of Operation Gratitude. The organization's website lists suggested items for donations, says John Reynolds, MBA '15, "and we will be shipping the donated items to them." According to Bharat Ganesan, MBA '15, boxes have already been placed in the business school commons for daily collection from Nov. 3 until Nov. 13, "when we will have a big recap of everything that has been collected." Beaty says, “Our country is what it is, in large part, due to the sacrifices of our veterans." The mission of the Witness to War foundation "is to ensure that those stories of sacrifice and dedication are preserved for as many combat veterans as possible. We are losing WWII veterans at a rate of one every 90 seconds and many stories will soon be lost forever, lending urgency to our mission,” he notes. Veterans Day at Emory is sponsored by the Emory Veterans Association, Employee Council, Student Government Association and the Emory Alumni Association. Aftab Ansari, pathology professor in the School of Medicine, has helped coordinate events since 2009, including providing refreshments for veterans and a meal to thank event organizers. "It gives me a great sense of pride and joy to celebrate Veterans Day every year here at Emory because I believe we do not spend enough time to stop and thank those who have served our country, those who continue to serve our country and those of course who paid the ultimate price," says Ansari, who served nearly a decade in the U.S. Navy.